Not to be confused with ACE inhibitor. An acetylcholinesterase inhibitor (often abbreviated AChEI) or anti-cholinesterase is a chemical or a drug that inhibits the acetylcholinesterase enzyme from breaking down acetylcholine, thereby increasing both the level and duration of action of the neurotransmitter acetylcholine. Acetylcholinesterase inhibitors are classified as reversible, irreversible, or quasi-irreversible (also called pseudo-irreversible). Organophosphates like TEPP and sarin inhibit cholinesterases, enzymes that hydrolyze the neurotransmitter acetylcholine. The active centre of cholinesterases feature two important sites, namely the anionic site and the esteratic site. After the binding of acetylcholine to the anionic site of the cholinesterase, the acetyl group of acetylcholine can bind to the esteratic site. Important amino acid residues in the esteratic site are a glutamate, a histidine, and a serine. These residues mediate the hydrolysis of the acetylcholine. At the esteratic site the acetylcholine is cleaved, which results in a free choline moiety and an acetylated cholinesterase. This acetylated state requires hydrolysis to regenerate itself. 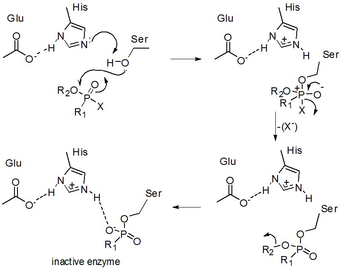 Inhibitors like TEPP modify the serine residue in the esteratic site of the cholinesterase. The phosphorylation mechanism by which cholinesterases are inhibited. The organophosphate binds first to the serine residue in the esteratic site of the cholinesterase and after transformation to a phosphate molecule, it binds the histidine residue. This results in occupation of the esteratic site and inhibition of the cleaving activity of the cholinesterase. This phosphorylation inhibits the binding of the acetyl group of the acetylcholine to the esteratic site of the cholinesterase. Because the acetyl group can’t bind the cholinesterase, the acetylcholine can’t be cleaved. Therefore the acetylcholine will remain intact and will accumulate in the synapses. This results in continuous activation of acetylcholine receptors, which leads to the acute symptoms of TEPP poisoning. The phosphorylation of cholinesterase by TEPP (or any other organophosphate) is irreversible. This makes the inhibition of the cholinesterase permanent. In this reaction scheme the E indicates the cholinesterase, PX the TEPP molecule, E*PX the reversible phosphorylated cholinesterase, k3 the reaction rate of the second step, EP the phosphorylated cholinesterase and X the leaving group of the TEPP. The irreversible phosphorylation of the cholinesterase occurs in two steps. In the first step the cholinesterase gets reversibly phosphorylated. This reaction is very fast. Then the second step takes place. The cholinesterase forms a very stable complex with TEPP, in which TEPP is covalently bound to the cholinesterase. This is a slow reaction. But after this step the cholinesterase is irreversibly inhibited. The time dependent irreversible inhibition of the cholinesterase can be described by the following equation. In this formula, E is the remaining enzyme activity, E0 is the initial enzyme activity, t is the time interval after mixing of the cholinesterase and the TEPP, KI is the dissociation constant for cholinesterase-TEPP complex (E*PX) and I is the TEPP concentration. The reaction mechanism and the formula above are both also compatible for other organophosphates. The process occurs in the same way. Furthermore, certain organophosphates can cause OPIDN, organophosphate-induced delayed polyneuropathy. This is a disease, which is characterized by degeneration of axons in the peripheral and central nervous system. This disease will show a few weeks after contamination with the organophosphate. It is believed that the neuropathy target esterase (NTE) is affected by the organophosphate which induces the disease. However, there are no references found, which indicate that TEPP is one of the organophosphates that can cause OPIDN. To treat myasthenia gravis. In myasthenia gravis, they are used to increase neuromuscular transmission. To treat Alzheimer's disease, the Lewy body dementias and Parkinson's disease. In these neurodegenerative conditions AChEIs are primarily used to treat the cognitive (memory and learning deficits mostly) symptoms of dementia. These symptoms are attenuated due to the role of acetylcholine in cognition in the CNS. There is some evidence to suggest that AChEIs may attenuate psychotic symptoms (especially visual hallucinations) in Parkinson's disease. To treat cognitive impairments in patients with schizophrenia. There is some evidence to suggest efficacy in treating positive, negative and affective symptoms. As a treatment for autism and to increase the percentage of Rapid eye movement sleep in autistic children, in line with the mechanism by which they encourage lucid dreaming. Actions on the neuromuscular junction will result in prolonged muscle contraction. The effects of neostigmine on postoperative nausea and vomiting are controversial and there is not a clear linkage in clinical practice, however, there is good evidence to support the reduction in risk when anticholinergic agents are administered. Administration of reversible cholinoesterase inhibitors is contraindicated with those that have urinary retention due to obstruction. When used in the central nervous system to alleviate neurological symptoms, such as rivastigmine in Alzheimer's disease, all cholinesterase inhibitors require doses to be increased gradually over several weeks, and this is usually referred to as the titration phase. Many other types drug treatments may require a titration or stepping up phase. This strategy is used to build tolerance to adverse events or to reach a desired clinical effect. This also prevents accidental overdose and is therefore recommended when initiating treatment with drugs that are extremely potent and/or toxic (drugs with a low therapeutic index). Rosmarinic acid - ester of Caffeic acid. Found in plants species of family Lamiaceae. ^ a b c d e f Čolović, Mirjana B.; Krstić, Danijela Z.; Lazarević-Pašti, Tamara D.; Bondžić, Aleksandra M.; Vasić, Vesna M. (2013-05-01). "Acetylcholinesterase Inhibitors: Pharmacology and Toxicology". Current Neuropharmacology. 11 (3): 315–335. doi:10.2174/1570159X11311030006. ISSN 1570-159X. PMC 3648782. PMID 24179466. ^ a b O'Brien, Richard D. (2013-10-22). Toxic Phosphorus Esters: Chemistry, Metabolism, and Biological Effects. Elsevier. ISBN 978-1-4832-7093-7. ^ Roberts, Stephen M.; James, Robert C.; Williams, Phillip L. (2014-12-08). Principles of Toxicology: Environmental and Industrial Applications. John Wiley & Sons. ISBN 978-1-118-98248-8. ^ Lotti, Marcello; Moretto, Angelo (2005-01-01). "Organophosphate-induced delayed polyneuropathy". Toxicological Reviews. 24 (1): 37–49. doi:10.2165/00139709-200524010-00003. ISSN 1176-2551. PMID 16042503. ^ Colovic, MB; Krstic, Danijela Z.; Lazarevic-Pasti, Tamara D.; Bondzic, Aleksandra M.; Vasic, Vesna M. (2013). "Acetylcholinesterase Inhibitors: Pharmacology and Toxicology". Current Neuropharmacology. 11 (3): 315–335. doi:10.2174/1570159X11311030006. PMC 3648782. PMID 24179466. ^ Yuschak, Thomas (2006). Advanced Lucid Dreaming: The Power of Supplements. Lulu. ISBN 978-1430305422. ^ Taylor, D; Paton, C; Shitij, K (2012). Maudsley Prescribing Guidelines in Psychiatry (11th ed.). West Sussex: Wiley-Blackwell. ISBN 978-0-47-097948-8. ^ Singh, J; Kour, K; Jayaram, MB (January 2012). "Acetylcholinesterase inhibitors for schizophrenia". The Cochrane Database of Systematic Reviews. 1: CD007967. doi:10.1002/14651858.CD007967.pub2. PMID 22258978. Lay summary. ^ Choi, KH; Wykes, T; Kurtz, MM (September 2013). "Adjunctive pharmacotherapy for cognitive deficits in schizophrenia: meta-analytical investigation of efficacy". The British Journal of Psychiatry. 203 (3): 172–178. doi:10.1192/bjp.bp.111.107359. PMC 3759029. PMID 23999481. ^ Ribeiz, SR; Bassitt, DP; Arrais, JA; Avila, R; Steffens, DC; Bottino, CM (April 2010). "Cholinesterase Inhibitors as Adjunctive Therapy in Patients with Schizophrenia and Schizoaffective Disorder A Review and Meta-Analysis of the Literature". CNS Drugs. 24 (4): 303–317. doi:10.2165/11530260-000000000-00000. PMID 20297855. ^ Buckley, A. W.; Sassower, K.; Rodriguez, A. J.; Jennison, K.; Wingert, K.; Buckley, J.; Thurm, A.; Sato, S.; Swedo, S. (2011). "An Open Label Trial of Donepezil for Enhancement of Rapid Eye Movement Sleep in Young Children with Autism Spectrum Disorders". Journal of Child and Adolescent Psychopharmacology. 21 (4): 353–357. doi:10.1089/cap.2010.0121. PMC 3157749. PMID 21851192. ^ Handen, B. L.; Johnson, C. R.; McAuliffe-Bellin, S.; Murray, P. J.; Hardan, A. Y. (2011). "Safety and Efficacy of Donepezil in Children and Adolescents with Autism: Neuropsychological Measures". Journal of Child and Adolescent Psychopharmacology. 21 (1): 43–50. doi:10.1089/cap.2010.0024. PMC 3037196. PMID 21309696. ^ Inglis, F. (2002). "The tolerability and safety of cholinesterase inhibitors in the treatment of dementia". International Journal of Clinical Practice. Supplement (127): 45–63. PMID 12139367. ^ Barash. Clinical Anesthesia, 7th edition. Pages 552-554. ^ Inglis, F (2002). "The tolerability and safety of cholinesterase inhibitors in the treatment of dementia". International Journal of Clinical Practice. Supplement (127): 45–63. PMID 12139367. ^ Karadsheh, N; Kussie, P; Linthicum, DS (1991). "Inhibition of acetylcholinesterase by caffeine, anabasine, methyl pyrrolidine and their derivatives". Toxicology Letters. 55 (3): 335–42. doi:10.1016/0378-4274(91)90015-X. PMID 2003276. ^ Vladimir-Knežević, Sanda; Blažeković, Biljana; Kindl, Marija; Vladić, Jelena; Lower-Nedza, Agnieszka D.; Brantner, Adelheid H. (2014-01-09). "Acetylcholinesterase Inhibitory, Antioxidant and Phytochemical Properties of Selected Medicinal Plants of the Lamiaceae Family". Molecules. 19 (1): 767–782. 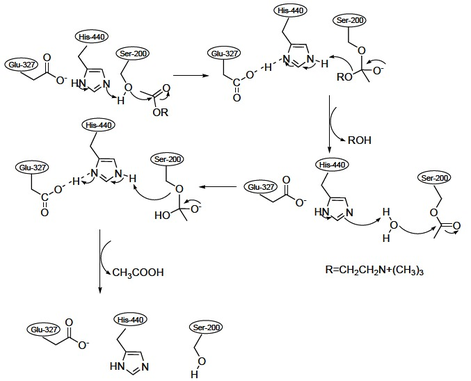 doi:10.3390/molecules19010767. PMC 6271370. PMID 24413832. Archived from the original on 2015-12-11. ^ Miyazawa, Mitsuo; Yamafuji, Chikako (2005-03-09). "Inhibition of acetylcholinesterase activity by bicyclic monoterpenoids". Journal of Agricultural and Food Chemistry. 53 (5): 1765–1768. doi:10.1021/jf040019b. ISSN 0021-8561. PMID 15740071. ^ Perry, Nicolette S. L.; Houghton, Peter J.; Theobald, Anthony; Jenner, Peter; Perry, Elaine K. (2000-07-01). "In-vitro Inhibition of Human Erythrocyte Acetylcholinesterase by Salvia lavandulaefolia Essential Oil and Constituent Terpenes". Journal of Pharmacy and Pharmacology. 52 (7): 895–902. doi:10.1211/0022357001774598. ISSN 2042-7158. PMID 10933142. ^ Wang, BS; Wang, H; Wei, ZH; Song, YY; Zhang, L; Chen, HZ (2009). "Efficacy and safety of natural acetylcholinesterase inhibitor huperzine A in the treatment of Alzheimer's disease: an updated meta-analysis". Journal of Neural Transmission. 116 (4): 457–65. doi:10.1007/s00702-009-0189-x. PMID 19221692.